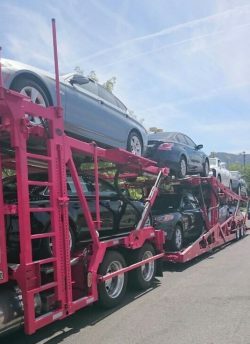 San Diego Auto Shipping offers a wide range of car transport services to its customers. When you trust your vehicle to our company, we promise to deliver it to you safe and sound. Our team of experts does all possible to alter the stereotype of car transport being a bother. Our company will do everything to make car transport simple for you when you book auto shipping with us. Car Transport is a very easy process when you do it with San Diego Auto Shipping. You will feel taken care of from the moment you call us. There are many things to a concern of and stress about when you’re moving or going away for a long period. But with us, car transport will not be one of them. If you have bought a vehicle from an out-of-state dealer, we will deliver it. If your company is relocating, we are always here to help you. When it’s a PCS season, we will help your family move cars to your new station. All types of car transport are available with us: open, enclosed, door-to-door and expedited. Moreover, San Diego Auto Shipping delivers vehicles door-to-door across 50 states of the United States, including Alaska and Hawaii. , We’ll be happy to ship for you, whether you’re going from Arizona to California or from Florida to Alaska. And the most important is that our car transport services are really cost-effective. We do our best to get you the highest quality of service combined with a low price! San Diego Auto Shipping annually ships thousands of vehicles countrywide. Furthermore, we ship not only cars but other vehicles as well, such as buses, trucks and even boats. This is the key to our increasing numbers of new and returning customers. Our Free Quote is Available Online.